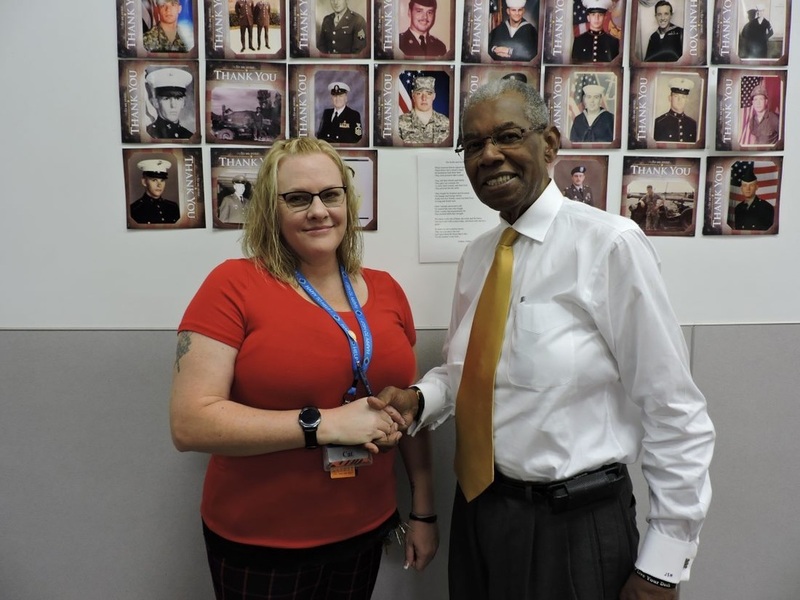 T-L Photo/JANELL HUNTER - Underground Railroad Museum Founder/Curator John S. Mattox receives a $1,500 donation from St. Clairsville Sam’s Club General Manager Cat Litchko through the Sam’s Club Community Grant Program. ST. CLAIRSVILLE — Sam’s Club General Manager Cat Litchko said she and her associates care about the local community and want to enrich residents’ knowledge of history. On Tuesday, Litchko donated $1,500 of a $10,000 Wal-Mart company charity fund to a cause that is near and dear to her heart, the Underground Railroad Museum of Flushing and its acquisition of the Benjamin Lundy House in St. Clairsville. John Mattox, URRM curator and founder, received the donation and expressed his heartfelt gratitude for the grant. “The reason I am so excited about what the Wal-Mart Foundation does is that they give back to the community. By giving back to the community they are showing that where they buy or sell, they participate. I think that when you have an organization like Wal-Mart and Sam’s Club, and they have been doing what they have been doing for years, I think the public needs to know,” said Mattox. Litchko said she and Sam’s Club have donated to the URRM and partnered many times with Mattox in the past. “This is something that I do on a yearly basis. I work very closely with Dr. Mattox in understanding what hidden treasures we have in this area, the rich history of this area. The more we know about the history here, the more we can understand one another, and the better place and community we can be,” said Litchko. Litchko said she is passionate about funding the URRM because many lessons the museum holds are not taught in local schools. “Just about every university, college, high school and grade school has been to the museum,” said Mattox. The money for the grant comes from the Sam’s Club Community Grant Program, part of the Wal-Mart Foundation, and can be applied for online. “At the local level, Sam’s Club facilities are encouraged to support nonprofits or other causes important to their community, provided they fall within one of the Wal-Mart Foundation’s focus areas: Opportunity, Sustainability and Community,” the Wal-Mart Foundation website states. The URRM is a nonprofit organization that operates solely on donations. Mattox said he works hard to provide such a professional presentation that people would be embarrassed to leave the museum without leaving a donation. “We do the same thing in the Upper Ohio Valley that they do at the museums in D.C. and Cincinnati, and we want to make sure that people don’t have to travel hundreds of miles to find out what’s in their own backyard. We do the same thing, just on a smaller scale. If I was to take federal funding, I would have to charge a fee, and we don’t sell our culture,”Mattox added. Many other community organizations have been helped through Wal-Mart Foundation grant and charity programs as well. Litchko said she and her Sam’s Club associates volunteer together and donate to causes including food pantries and the local Juvenile Diabetes Foundation. They also partner in education with Wheeling Middle School and stuff hundreds of stockings at Christmas time to send to soldiers serving overseas, as well as many other causes. “I try to help out as much as possible from a community standpoint. I really think it’s something that Wal-Mart and Sam’s Club are not recognized for, nor is it talked about so people know. I’ve made a lot of progress in the community because I help out quite a bit,”said Litchko. ​Eastern Ohio has a valuable resource available in Flushing that serves as a window to our past, shedding light on a troubled time in American history. Situated along High Street in a former bank building is the Underground Railroad Museum. Curator John Mattox founded the institution with his late wife, Rosalind, several years ago. Since then, he has worked hard not only to collect items and artifacts of the slave era, but he has sought creative ways to fund the facility so that it will be available to teach future generations important lessons about who we are, where we came from and where we are going. This week, a local business again pledged its support to the museum and donated money to help fund its operations. Sam’s Club General Manager Cat Litchko said she and her store associates care about the local community and want to help enrich residents’ knowledge of our history. Sam’s Club donated $1,500 from a $10,000 Wal-Mart company charity fund to the museum on Tuesday. Not only will that money help with museum operations, but it may help Mattox to fund the purchase of another site in Belmont County. Mattox and the museum are working to buy the former home of early Quaker abolitionist Benjamin Lundy. Located on Main Street in St. Clairsville, the building dates back to the early 19th century and is the site where Lundy started an organization dedicated to eliminating slavery in the United States. The museum is a nonprofit organization that operates solely on donations, so every gift like the one from Sam’s Club this week is key to its continued operations. Mattox said the museum does the same thing that larger facilities in Washington, D.C., and Cincinnati do with the help of federal funding. “We want to make sure that people don’t have to travel hundreds of miles to find out what’s in their own backyard,” he said. Mattox chooses not to accept federal funds because he would then be required to charge a fee. “We don’t sell our culture,” he added. We applaud Sam’s Club for supporting the museum and urge anyone who values local history to follow suit. Donate to the museum if you can afford to, or contact Mattox to learn about other ways you could help. ST. CLAIRSVILLE - The Eastern Ohio Alumni Chapter of Ohio University has named John S. Mattox as the 2016 Austin C. Furbee Award honoree, in recognition of his dedication and contribution to Ohio University and the community. A dinner was held in his honor on Wednesday at Belmont Hills Country Club in St. Clairsville. Ohio University Eastern Campus Dean Paul Abraham introduced Mattox at the event. "Dr. Mattox clearly exemplifies the intent of the Austin C. Furbee Award," said Abraham. "He is most deserving of an honor that seeks to recognize an individual for his steadfast and impactful service to our campus and the community." Known for his affable personality, Mattox is a longtime member of the Ohio University Eastern Campus Coordinating Council, co-chair of the university's African American Cultural Committee, and has been a vital contributor to the Department of African American Studies' African American Presence in the Ohio River Valley research project. The grant-funded multimedia project documented the contributions of people of color to the history and development of Appalachia. He also funds an annual non-restricted $500 scholarship to the Eastern Campus. 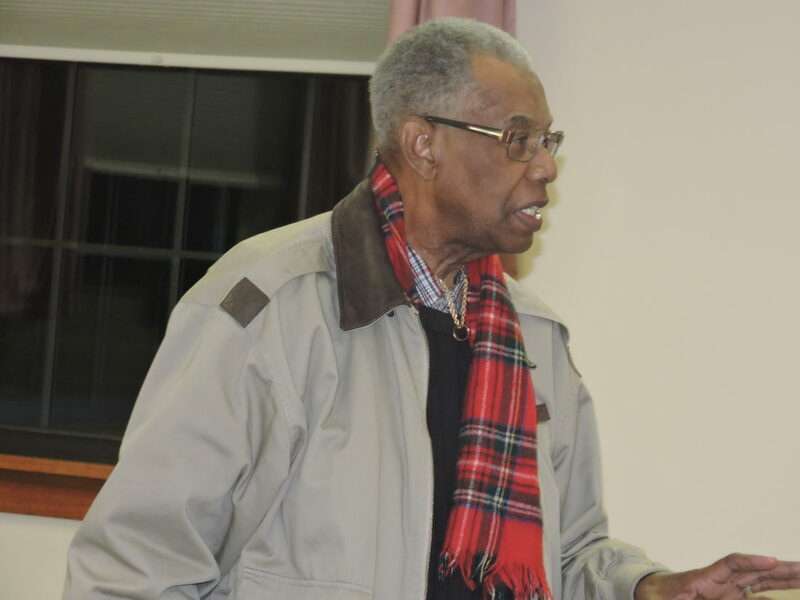 A native of Raleigh, N.C., and a U.S. Air Force veteran, Mattox has been active in dozens of local and national organizations since moving to his late wife, Rosalind's, hometown of Flushing in 1973. 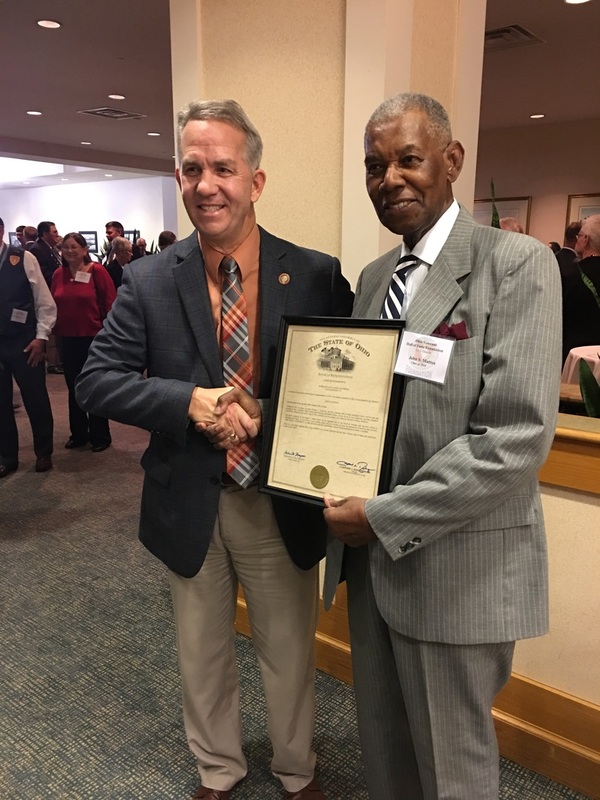 In fact, the Underground Railroad Museum shares its building with A Special Wish Foundation, an organization for which Mattox serves as national chairman and National Board of Governors member. Accolades are nothing new for Mattox, a retired insurance agent. In 2008, he was presented with an honorary doctorate of public service from Ohio University. He has also received the Belmont County Tourism Person of the Year recognition, the West Virginia Education Association's Effie Mayhan Brown Award, and the Community Builder Awards from the cities of Steubenville and Flushing. Mattox has served as the local president of A Special Wish Foundation, and chairman of the national board of A Special Wish Foundation. He is also a board member for various companies and organizations, including the Ohio University Eastern Regional Coordinating Council, Harrison County Hospital, Belmont County Correctional Institution Community Board, Sargus Juvenile Center, and Bank One in Wheeling. 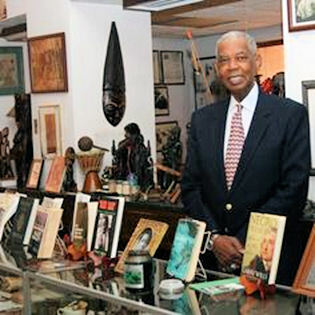 Mattox is best known for his work with the Underground Railroad Museum, which displays more than 30,000 items related to the Underground Railroad and slavery region. He is currently spearheading the inaugural Juneteenth Celebration in the region, as well as in the state of Ohio. Juneteenth is the oldest known celebration commemorating the ending of slavery in the United States. A Juneteenth Celebration event will be held June 17 at Ohio University's Eastern Campus to benefit the Benjamin Lundy Home in St. Clairsville and the Union Humane Society. The theme for the event will be Rozz's Garden, in honor of John's late wife. Despite his remarkable accomplishments, Mattox is most proud of his family life. He was married for 50 years to the late Rosalind L. Stewart-Mattox. They established a lifetime of roots and memories in Flushing, where they raised two children, John R. Mattox (now 41), and Suzanne Evans (now 40). Today, John R. (Jennifer) and Suzanne (James Evans) are married and have two children each, making John S. a grandfather four times over. "I am overwhelmed to have been selected by the Eastern Ohio Alumni Chapter as the Austin C. Furbee recipient," said Mattox. "I never expected to be on this list, and this will take a long time to soak in. I am especially proud of the bond that I have formed over the years with Ohio University Eastern because it is such a special place, providing much-needed access to high quality, affordable higher education to citizens of the Ohio Valley for the last 60 years." Mattox continued, "Life is the ultimate learning experience, and one of the lessons that I have learned is that I didn't get here on my own. I have been blessed to have been supported and pointed in the right direction countless times by my wife, Roz, and other members of my family. It is in this spirit that I am committed to giving back and trying to make a difference for Ohio University Eastern and the greater community. Thank you, Roz, for 50 wonderful years and a lifetime of memories. It is my privilege to accept this award in your name here tonight." Austin C. Furbee, for whom the award is named, played a key role in the formation of the Ohio University Eastern Campus. While serving as a Belmont County commissioner, Furbee realized that there were limited opportunities for higher education in the Ohio Valley. As a result, he became instrumental in the commission's acquisition of the former Belmont County Experimental Station farmland, which was to become a regional campus of Ohio University.